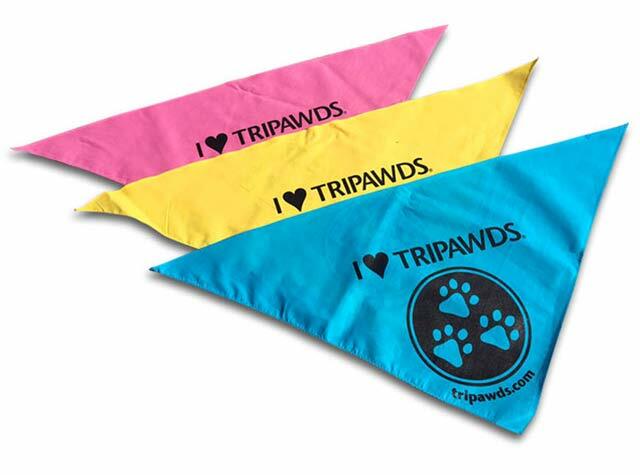 Name Your Price for Tripawds Bandanas! Add a 4 in. vinyl sticker or 1.25 in. button with the 3-paw merit badge logo. 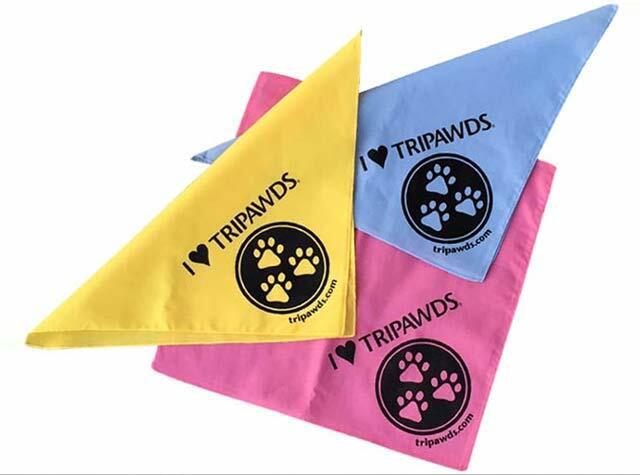 Show the world that you love Tripawds! 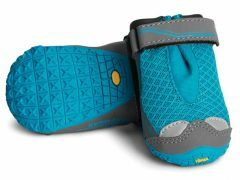 Two sizes and three colors to choose from – choose Large or Small and Yellow, Pink, or Blue. Large triangle bandanas are perfect for three legged dogs of any size, and people too! Small square bandanas are ideal for small breeds and three legged cats. Price includes free postal delivery via USPS. direct from Tripawds Headquarters. 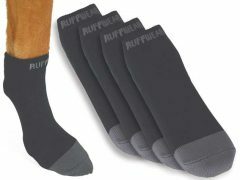 Send them as a gift to your favorite Tripawds Pals! Just include a mailing address and a note, we’ll send a handwritten card. 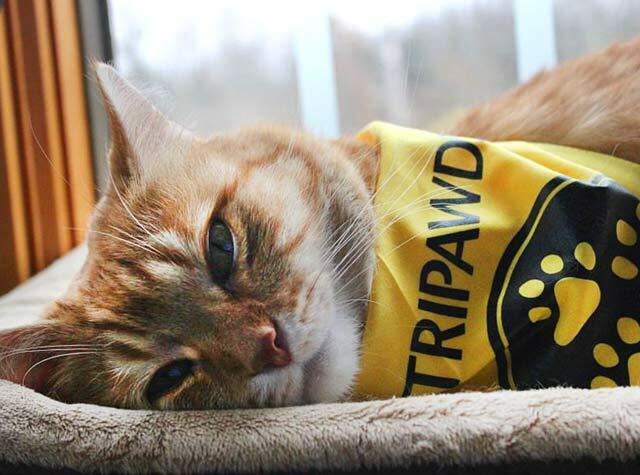 Add a 3-paw sticker or button to show your support for the Tripawds community! 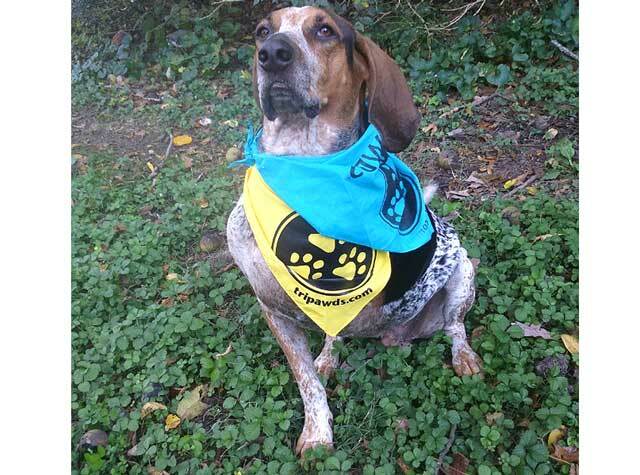 These are beautiful bandanas, of high quality, with bold graphics–such a greyt way to show off Tripawds!! 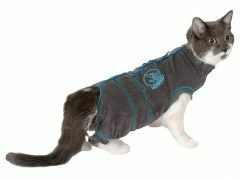 Fallon looks so fantastic in hers, we may get one for Maggie soon!! Three paws up here!! The small bandanas are the purrfect size for kitties or small breeds pups. The colors are fantastic we have a yellow and blue one. Purrkins wears his bandana and even falls asleep in it. We have one tied to his carrier to show our tripawd pride when we are out.